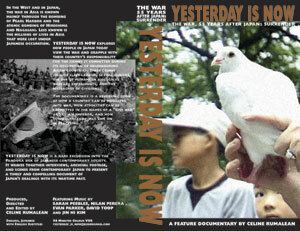 "Yesterday is Now - the War, 55 Years after Japan's Surrender"
"Yesterday is Now" reveals the divisions in today's Japanese society as it struggles with the question of how to consider the war and Japan's responsibility for the crimes it committed during its occupation of neighbouring Asian countries between 1895-1945. These crimes include sexual slavery, slave labour, the use of humans in biological warfare experiments, and the massacres of civilians. Frank and probing interviews with a diverse collection of individuals - families of the Japanese war dead, former soldier, A-bomb survivor, teacher, labour unionist, journalist, artists, students, politicians and right wing nationalists - together with archival footage and images from Japan's modern cityscapes make up a riveting chronicle of the country's dealings with the unfinished business of its wartime past. Despite historic differences, this exploration of the past resonates eerily with the present: this is a revealing look at how a country can be mobilized into war, how atrocities can be committed in the name of a "just war," and how consequences of war live on in peacetime.